There's a pretty remarkable new stadium at Euro Pony. I recently got the grand tour by paolo Shinn, the owner. As the stadium is 1200m in the air, it requires a teleporter to get to. 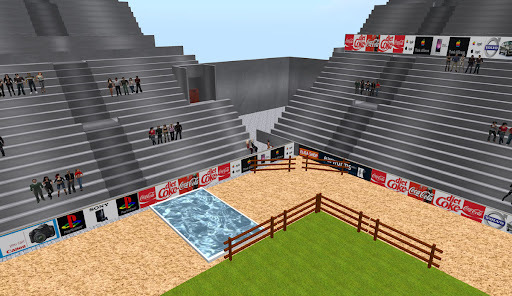 This can be found just east of the landing zone, clearly marked "Stadium". Once there, following the big animated red arrows on the ground will take you to the entrance. Past the turnstiles, more arrows until you reach the grandstand. And grand it is : this place is huge! Cardboard cutout spectators help to promote the feeling of being in a stadium, with a crowd, but without the lag. 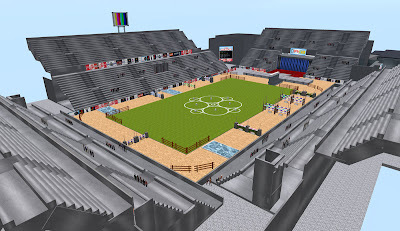 The centre of the stadium is the size of a football field, and currently has a dressage field on. Paolo mentioned that this will be changed every month. Around the edge of the field is a steeplechase course with lanes for up to six ponies; the lanes crisscross at each jump to ensure no one pony gets the inside track the whole way round. At the south side of the stadium is the presentation stage, and behind the curtain are stalls for pre and post race ponies to relax. Bearing east takes you to a pony TV studio - perhaps for commentators to sit and watch the events, along with interviews with trainers and owners? After seeing this, I was not surprised at Paulo's excitement to show off the stadium. It is impressive, and I am looking forward to seeing events held there soon.